They promised a motown party and that is exactly what we got! How could it not be with that iconic lineup – Sounds of the Supremes, Sister Sledge, Village People, The Pointer Sisters, Kool & The Gang and The Jacksons. Sounds of the Supremes kicked off the party playing homage to the great trio. With ‘Baby Love’, ‘You Can’t Hurry Love’ and ‘You Keep Me Hanging On’, the Sound of the Supremes swung the audience into the groove. Sister Sledge hammered the crowd with feel good tunes. As bodies twisted to the ground and slowly built up to flailing arms in the air, ‘Shout’ brought the high energy, but ‘We Are Family’ was a moment of solidarity. The crowd sang as one, as family, which remained the same for the rest of the evening. So an American Indian chief, the construction worker, a member of the military, a biker and a cowboy walk onto the stage. No this isn’t the start of a cheesy joke, it’s The Village People set. With hits ‘Macho Man’, ‘Can’t Stop The Music’, ‘Go West’ and ‘In The Navy’ filling their set with a whole lot of booty shaking and promiscuous crowd teasing, they were one hell of a crowd pleaser. Closing out their set was the one and only ‘YMCA’ with the largest synchronised dance I had seen in my life, running from the barrier all the way to the top of the hill. Even the security were getting into it. The Pointer Sisters, now one sister with daughter and granddaughter, emerged in all of their glory to deliver an exciting and powerful set. From ‘I’m So Excited’ through to the song that made ladies swoon over Hugh Grant again in Love Actually, ‘Jump (For My Love)’ the family showed that their music translates across generations. Kool & the Gang are just as cool as ever and the ladies were stumbling for them. Not only did ‘Ladies Night’ win them over, their straight up 90’s RnB choreography and flash outfits were the icing on the cake. ‘Get Down On It’ brought the club vibe but the party wasn’t in full swing until ‘Celebration’, the perfect lead into the headline act of the evening. The lights dim and the screen lights up. Vintage footage of the Jacksons throughout their five decade career rolls, showing the group in all of their forms. From Tito to Jermaine, Marlon to Jackie, the late Michael and Randy – footage of the live performances, behind the scenes takes, television appearances and home video provide a near tear-jerking moment for the foursome to enter stage left to. Without hesitation they launch into ‘Can You Feel It’ with a euphoric energy lifting around them. ‘Blame It On The Boogie’ shook some shoulders and a cover of MJ’s ‘Rock With You’ skipped a few heartbeats. ‘Enjoy Yourself’, ‘Show You The Way To Go’ and ‘Lovely One’ followed back to back but it was a four song mashup that took it up a notch. ‘I Want You Back’, ‘ABC’, ‘The Love You Save’ and ‘Dance Machine’ was truly elevating as the foursome grooved in superhuman styling. 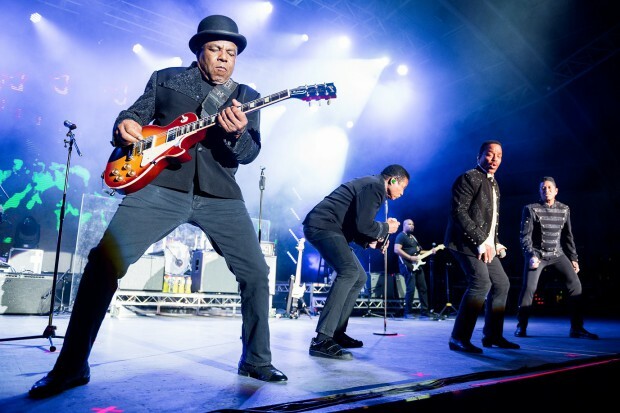 The Jacksons are all round performers and entertainers with every inch of the stage run on. ‘I Never Can Say Goodbye’ showed off their harmonious vocal lines as did the swaying ‘I’ll Be There’. The final hit to the motown party came in the form of ‘Wanna Be Startin’ Somethin’’ and ‘Shake Your Body (Down To The Ground)’, a dance extravaganza of legendary status. The Sumer Series was a celebration of the Motown Label and a genre of music that has influenced pop, jazz, RnB and soul for half a century and it exceeded any expectation I had going in. Photos by Ian Laidlaw via Beat Mag.